Our data-acquisition systems are built to be as unique as the dams they monitor. They measure water pressure, flow and turbidity, soil movement, tilt, displacement, strain, load, vibration, overburden, generated power, machine status, and many other parameters. With a full range of network capabilities, real-time user interfaces, alarm capabilities, and compatibility with other systems, we put the controls in your hands. We can help you design and implement a customized system. 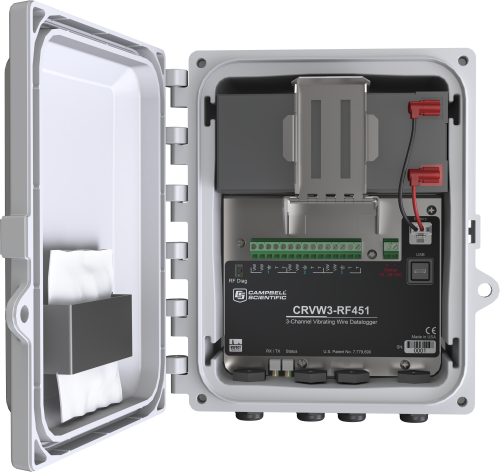 Our systems are rugged and low-power, adaptable to the harshest, most remote environments. We offer a variety of products that can be used to create systems for Dam Monitoring - Structural. Many of the major components used to create these systems are listed below. Please let us know if we can help you configure a system.